Do you get questions about fats like cooking oils? There are many misconceptions about fats and health and, without knowing the facts, your shoppers may be missing out on the bene­fits of heart-healthy oils. FACT: Research suggests eating about 1 tablespoon (16 grams) of corn oil daily may reduce the risk of heart disease due to the unsaturated fat and plant sterols content. FACT: Mazola® Corn Oil contains more cholesterol-blocking plant sterols than other cooking oils. It is 100 percent pure, naturally salt and cholesterol free, and contains vitamin E.
FACT: Mazola® Corn Oil has a high smoke point above 450°F and mild taste, making it appropriate for baking, grilling, sautéing and stir-frying. In a study published in the Journal of Clinical Lipidology (December 2014), two groups of subjects were given a balanced diet for 21 days that included three foods made with either a total of 4 tablespoons of corn oil or 4 tablespoons of EVOO. The foods were yogurt, a pumpkin muffin or carrot cake, and a rosemary garlic or wheat dinner roll. Participants who had the four tablespoons of corn oil daily in their food had a lower level of LDL (“bad”) cholesterol at the end of three weeks, as compared to those who consumed the EVOO. The corn oil group also had a lower total cholesterol level. This is because corn oil has more naturally-occurring phytosterols than extra-virgin olive oil, 528 versus 120 milligrams. And when it comes to cooking, remember that corn oil has a higher smoke point than olive oil –400-450 degrees F for corn oil, versus 325-375 F for olive oil. This, along with a naturally mild taste, makes corn oil more versatile in the kitchen than many cooking oils. ᴬ Based on analysis of corn oil and 2013 USDA comparison of other cooking oils: Corn oil has plant sterols content of 135.6 mg/serving vs. 30.0 mg/serving for Olive Oil, 40.8 mg/serving for Vegetable Oil, and 93.9 mg/serving for Canola Oil 2.
ᴮ Maki K, Lawless A, Kelley K, Kaden v, Geiger C, Dicklin M. Corn oil improves the plasma lipoprotein lipid proﬁle compared with extra-virgin olive oil consumption in men and women with elevated cholesterol: Results from a randomized feeding trial. J Clin Lipidol. Article in press. Accessed December 10, 2014. 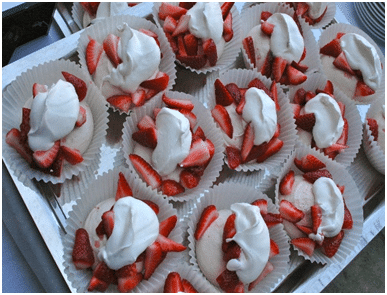 Few foods herald spring as well as beautiful strawberries. Number One: Strawberries are packed with nutrients. A cup-size serving contains more vitamin C than is found in an orange, fiber, folate and potassium. And all for just 45 calories. Strawberries are also a favorite Superfruit, meaning that they contain a variety of bioactive compounds that converge to fight oxidation and inflammation. More than 110 studies concerning strawberry consumption and human health have been published since 2006. Here’s one more: Strawberries work in diabetes meal planning. They provide just 7 grams of sugar per serving, less than apples, bananas, grapes and oranges, with a low glycemic index. 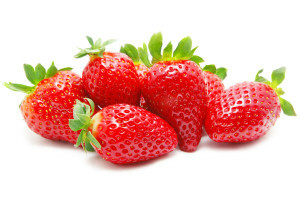 The American Diabetes Association names strawberries as one of ten superfoods in a diabetes meal plan. California is the leader in U.S. strawberry production, with 1.6 billion pounds of fresh strawberries and 400 million frozen strawberries produced annually. That’s 88% of all strawberries grown in the U.S. If you were at the Shopping for Health 2015 conference in Napa, are you still dreaming about this fabulous Strawberry Pavlova dessert? The fifth annual Shopping for Health conference for supermarket dietitians returned to the place where it all started in 2011 – gorgeous Napa, California! Top representatives from multiple supermarket chains around the country spent three days in Napa, networking, learning from nutrition and culinary presentations, and tasting recipes and foods prepared by some of the best chefs in the country. Leading food industry sponsors were also there to update this important group about their products. In just five years, Shopping for Health has become the premier annual gathering for supermarket dietitians who are interested in helping their stores better communicate nutrition news to shoppers. Menu Calorie Labeling in Supermarkets – Are you up on the new requirements that will hit in December? Food Styling Tricks of the Trade – Which 5 tools should you have for any TV segment or photo shoot to make your job easier? Beverages’ Role in the Health and Wellness of Your Shoppers. And your store. Something New for Summer Grilling: Lamb! If you couldn’t join us this year, we missed you! But check here in the coming weeks for photos, blog posts, special presentations and other information from the conference. We have it all here and are ready to share with you, and, if you’d like, put you in touch with the researchers and speakers who made the news. Here are a few photos below; check out the entire Napa 2015 conference photo gallery here. If you were at Shopping for Health 2015, what was your favorite part of the conference? We’d love for you to post here something that you learned! What happens when a select group of supermarket dietitians come together for three days, meeting with leading food industry executives to hear science and health updates, enjoy product tastings, and discuss ways to better reach shoppers with the nutrition news they need? 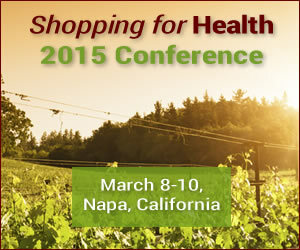 Shopping for Health 2015 will take place March 8 – 10 in beautiful Napa, California. This fifth annual conference will once again provide the supermarket dietitians with the information they need to help consumers make wise choices at the grocery store. 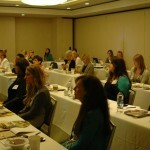 And, at the request of many retail dietitians, SFH 2015 will immediately follow the meeting of the Food & Culinary Professionals Dietary Practice Group of the Academy of Nutrition and Dietetics, allowing attendees to enjoy both meetings if they desire. Program activities include a session on food styling tricks of the trade and a discussion of the role of the supermarket in retail healthcare. 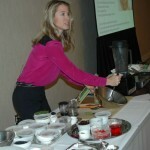 Attendees will enjoy a cooking demonstration and nutrition updates on foods and beverages ranging from water to walnuts. Shopping for Health is made possible by the support of food industry sponsors. For more information about Shopping for Health 2015, contact nancy@shoppingforhealth.org. 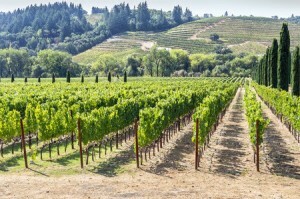 Shopping for Health 2015 will take place March 8 – 10 in beautiful Napa, California. Back by popular request from our retail dietitians, SFH 2015 will once again immediately follow the meeting of the Food & Culinary Professionals Dietary Practice Group of the Academy of Nutrition and Dietetics! Retail RDs who are guests of Shopping for Health will again have the option of flying to Napa before the SFH conference, in time to attend the DPG meeting. Look for your Invitation to Shopping for Health 2015 soon! *Application in process, as final program is developed. 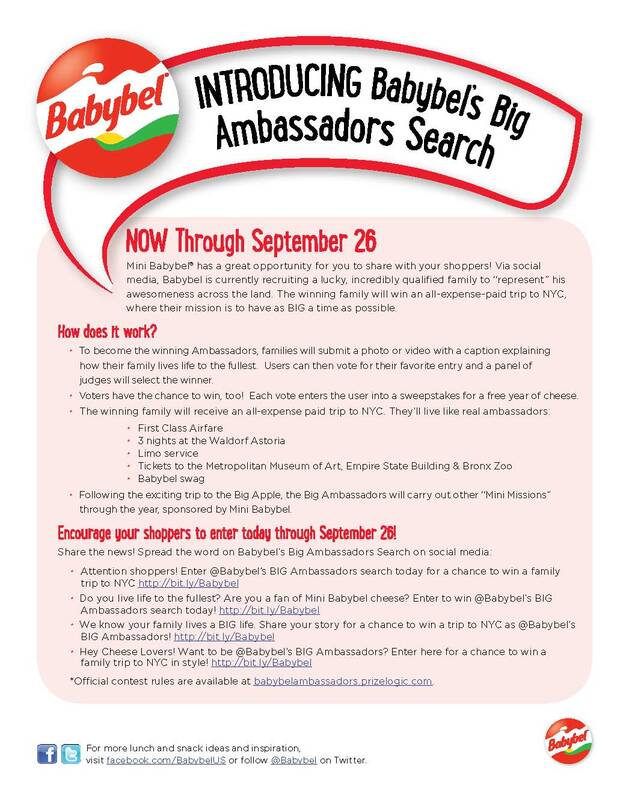 Mini-Babybel Contest for Your Shoppers – Tweet This Week! Posted September 22, 2014 by Shopping ForHealth & filed under News. Mini Babybel® has a great opportunity for you to share with your shoppers! Via social media, Babybel is currently recruiting a lucky, incredibly qualified family to represent his awesomeness across the land. The winning family will win an all-expense-paid trip to NYC, where their mission will be to have as BIG a time as possible. Encourage your shoppers to enter today through September 26 – details below! Posted September 16, 2014 by Shopping ForHealth & filed under Shopping for Health Success Stories. Shopping for Health works to provide high-quality, RD-reviewed materials and information about various food products to retail dietitians at grocery store chains throughout the U.S. and Canada. We are so pleased to see the many ways that those materials are used! When is a Snack No Longer a Snack? Posted September 9, 2014 by Shopping ForHealth & filed under Consumer Research, News. Here’s another interesting food trend reported at Shopping for Heath 2014 by NPD Group Food and Beverage Analyst Darren Seifer: What we traditionally think of as “snacking” – enjoying little nibbles between three big meals – is now an all-day affair, and as a result, traditional “snack foods” are now considered elements of meals. “Americans have become more accepting of the concept of ‘snacking’ as a way of eating,” said Seifer. “In the early 1990’s, more than 70 percent of people said that they try to avoid snacking entirely. People believed then that snacking was a symptom of bad eating habits that lead to things like obesity and overweight. 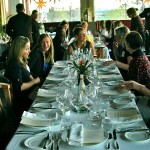 Most people say that they eat at 8:00 a.m, 12:00 noon and 6:00 p.m. –the traditional fare of breakfast-lunch-dinner. Added to that are additional eating times throughout the day: 10:00 a.m, 3:00 p.m. and that late-night refrigerator raid at 10:00 p.m.
An interesting result of this, according to Seifer, is that traditional snack foods (like potato chips, packages of crackers, small apples or cartons of yogurt) are now considered main-meal fare by many people. These foods are consumed with main meals 22% of the time and even as a total meal replacement 8 percent of the time. Posted September 1, 2014 by Shopping ForHealth & filed under News, Recipes. How many servings of grains do we need to eat every day? How many of those servings should be whole grains? Which rice types count as a whole grain? Which 6 states produce the bulk of US-grown rice? Name some of the vitamins that rice provides to the diet. How does enriched white rice contribute nutritionally to the diet? If a person suffers from gluten intolerance, meaning that they cannot consume grains like wheat, rye or barley, can they still eat rice? pepper and cooked rice. Serve immediately or cover and chill. 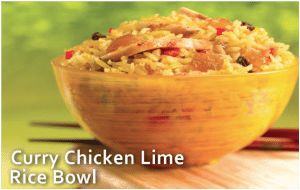 Posted August 26, 2014 by Shopping ForHealth & filed under News, Recipes. If you’re heating up the grill this Labor Day weekend, a tasty beer may already be top of mind. But did you think about further enhancing the delicious flavor of the beer in your glass by making it an ingredient in your holiday weekend dishes? Cooking with beer makes the food taste better than ever. Take advantage of the various flavors in the hundreds of beers available by experimenting with them in favorite recipes. Steam shellfish, mussels or shrimp in beer rather than water, for a tangy taste that complements the saltiness of seafood. Add a few tablespoons of beer to a salad dressing or a stir-fry. Beer also makes a wonderful marinade or sauce for grilling favorite meats and vegetables. Make glaze by combining in deep saucepan the beer, soy sauce, brown sugar, vinegar, ginger, sesame seeds, garlic and sesame oil. Bring to a boil. Reduce heat to medium-low; simmer 15 minutes or until mixture thickens and reduces to about 1 cup. Remove from heat and cool to room temperature. Place pork chops in shallow baking dish in single layer. Pour half of sauce over chops, turning to coat thoroughly. Cover dish with plastic wrap. Marinate in refrigerator at least 4 hours or up to overnight. Prepare gas or charcoal grill; lightly oil grill rack. Place chops on grill and cook, turning, about 6–8 minutes per side. Baste with remaining half of beer glaze sauce during last 5 minutes of cooking. Cook until chops are just cooked through in the center, and are nicely glazed. In small mixing bowl, stir together Stout Beer, cocoa powder, cinnamon, cumin, granulated garlic, brown sugar and salt. Place ground sirloin in large mixing bowl; pour beer mixture into meat. Stir gently until well-combined. Form meat into six patties. Prepare gas or charcoal grill, or pre-heat broiler. Place meat patties on grill or under broiler and cook about 5–7 minutes. Add onion rings to grill. Turn burgers and cook additional 5–7 minutes until cooked through to desired doneness. During final minutes of cooking burgers, top each with a slice of cheese. Add opened buns to grill, toasting just until golden. 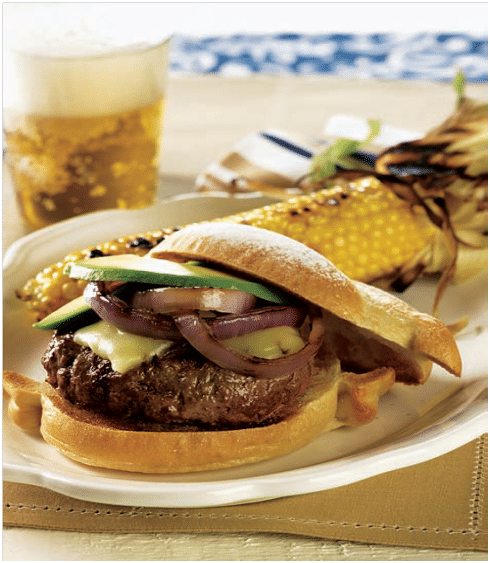 To assemble, place burgers on grilled buns and top with grilled onion and avocado slice.